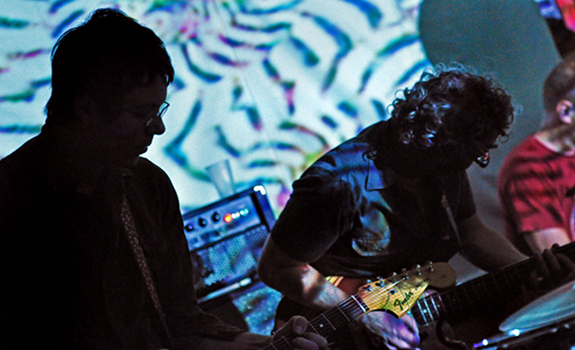 The Only Light On begins with a dreamy, shoegaze-like percussion and guitar pattern, fronted by a playful keyboard riff. Blending post-rock and shoegaze with elements of psychedelia, Ghost Box Orchestra finds a comfortable mix between being instrumental versions of Piano Magic and The Black Heart Procession. Vastly instrumental, Ghost Box Orchestra’s music finds solace in dreamscapes, and “Oh, The Moon Hangs Low” is no different. However, it has more of a rock edge to it, with heavier, louder guitars. And it has vocals, which sets the song apart from the others on The Only Light On. “Oh, The Moon Hangs Low” is explosive, hypnotic and swarming with the ethereal mystery you expect in post-rock meets shoegaze, and they execute it all masterfully. The Only Light On is available now from bandcamp. Above photo by Tom Gilmore. i like the fact that it was recorded in an abandoned masonic lodge. very cool. wonder if they saw Dan Brown while there.